Emerging Markets countries has been the main global economic growth for the past 10 years. After the economic crisis, these emerging markets countries have been outperformed many developed countries. You can invest in this emerging markets stocks using mutual funds. 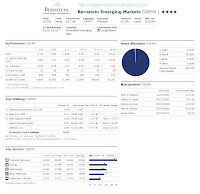 The following is the fund review of best emerging markets stock fund. 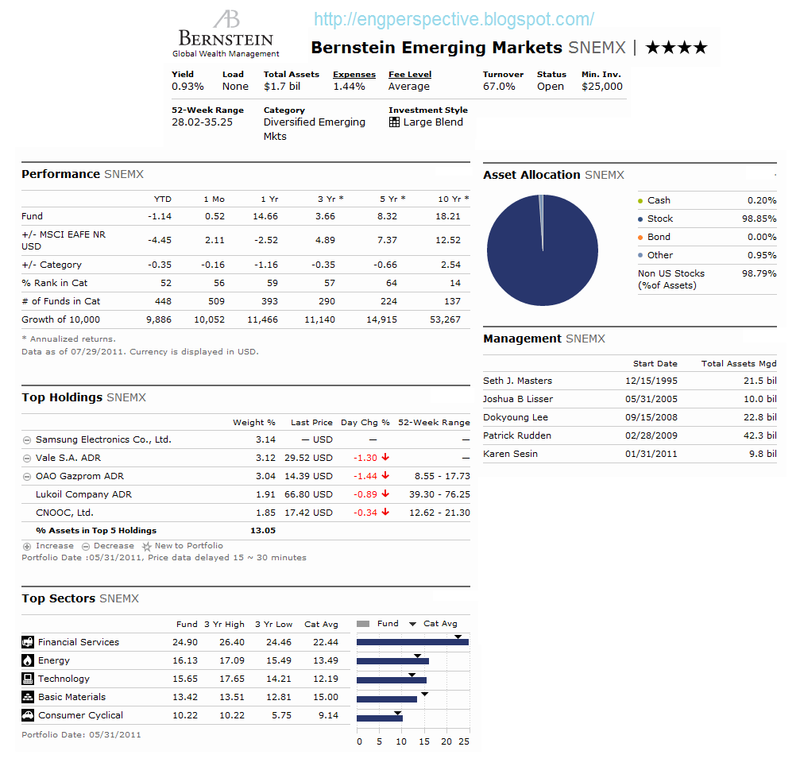 The Bernstein Emerging Markets fund objective is to provide long-term capital growth. The fund normally invests at least 80% of assets in securities of companies in emerging markets. It invests approximately 50% of assets in emerging markets value stocks and 50% of assets in emerging markets growth stocks. This EM stock fund may invest in more developed country markets. This AllianceBernstein fund is managed by Seth Masters since its inception in December 1995. This is a no load fund, it means there is no 12b1 fee as well no sales load fee (either front-end sales load or deferred sales load). It has an annual holdings turnover of 67% as of July 2011. This fund has total net assets of $1.79 billion. So far, this Bernstein fund has with 10 years positive returns and 5 years negative returns. The best achievement was in year 2009 with 87.40%. Morningstar has provided this fund with 4-stars return rating. The minimum initial investment for this SNEMX fund is $25,000 for brokerage account. This best diversified emerging markets stock fund is currently available for purchase from a limited of 4 brokerages. They are Northwestern Mutual Inv Srvc, LLC, DailyAccess Corporation RTC, Trade PMR Transaction Fee, and Waddell & Reed Choice MAP Flex. Please check with your brokerages for details. As of May 2011, the top holdings of this SNEMX fund are Samsung Electronics Co, Ltd (3.14%), Vales SA ADR (3.12%), OAO Gazprom ADR (3.04%), Lukoil Company ADR (1.91%) and CNOOC Ltd (1.85%). Majority of the assets are invested in stocks (98.85%). The top sectors are Financial Services (24.90%), Energy (16.13%), Technology (15.65%), Basic Materials (13.42%) and Consumer Cyclical (10.22%).